Fetch Sketchup 8 Source File (< 0.1 MB), Place cursor over link, Right mouse click, Select Save As. 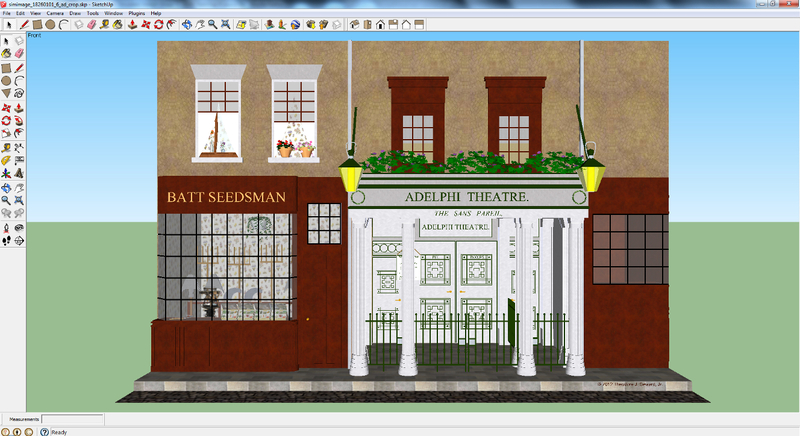 The following image is based on various sketches of the Adelphi Theatre produced in the 19th century. The simulation was created using the free version of Google's 3D drawing package Sketch Up 8. Free copies of Sketch Up may be downloaded from http://www.sketchup.com/intl/en/download/index.html. I've supplied a copy of the source file so users may produce other views or modify this one. Although there is a copyright on each image and in the Sketch Up source file, scholars are free to use the illustrations and source file providing they do not sell the images.